Last week we were in Normandy, France for a few days of glorious R&R. Trouville sur Mer beach. Deserted mostly. A stroll along the sand, a gentle breeze, sunshine on the face, watching seagulls chase the waves, truly restorative. Followed by a fab lunch, traditional style, Soupe a l’onion, Veau a la Normande, and then a long knitting session at home in front of a roaring fire – the best day! 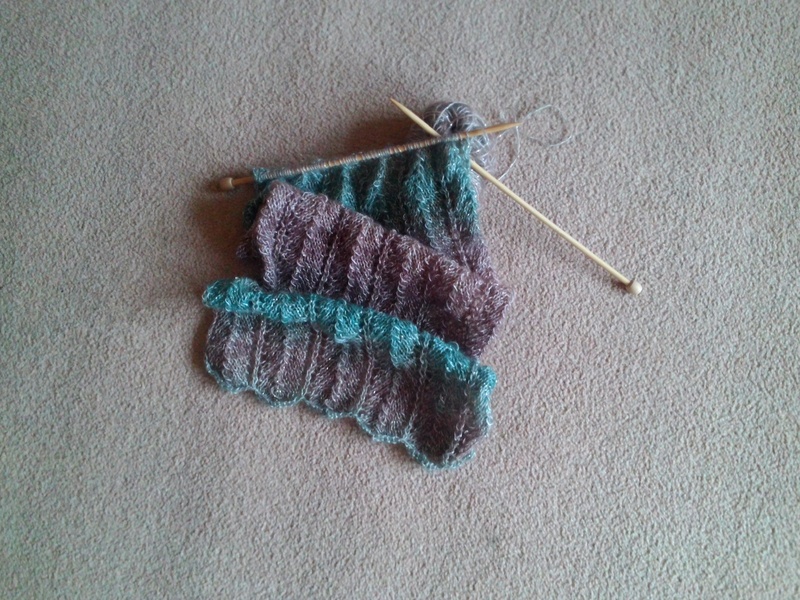 The knitting project photo is deliberately a ‘jumble’ because the finished item may be a gift. I don’t want the recipient to see exactly what it might look like! If you love books and France try and take a trip and tell us all about it! Even in the autumn you might sit outside at a pavement cafe, watch a game of boules …. ooh reminiscing …. This entry was posted in Uncategorized and tagged author, beach, France, knit, Normandy, Trouville, Trouville sur livres, Trouville sur Mer. Sitting knitting in my front room tonight, it’s a little chilly and I am thinking of fun places I have knitted and warm places I have knitted. The two are not always hand in hand. Amongst my favourites are several beaches and scrolling through my phone I have pictures of some of my favourite beaches, yay! No actual knitty pictures here, just beaches. I took the pictures myself. I must remember to get someone else to take photos of me actually knitting in future! So, a lovely long quiet sandy beach at Cabourg, Normandy, France. Another, with iconic blue and white sunshades – love it here – Trouville, Normandy, France. Lastly, Whitstable, Kent, UK – that’s the coffee and doughnut picture – at the beach but this is not a photo of the beach. I remember that day, a lovely wander along the beach, it was cold, I sat and knitted but not for long as my hands were cold, then I was in need of a hot drink and the doughnut was free! Would love to see if others knit at the beach. Going to put the heating on now ….. This entry was posted in Uncategorized and tagged beach, Cabourg, doughnut, France, knit, knitting, Normandy, Whitstable.